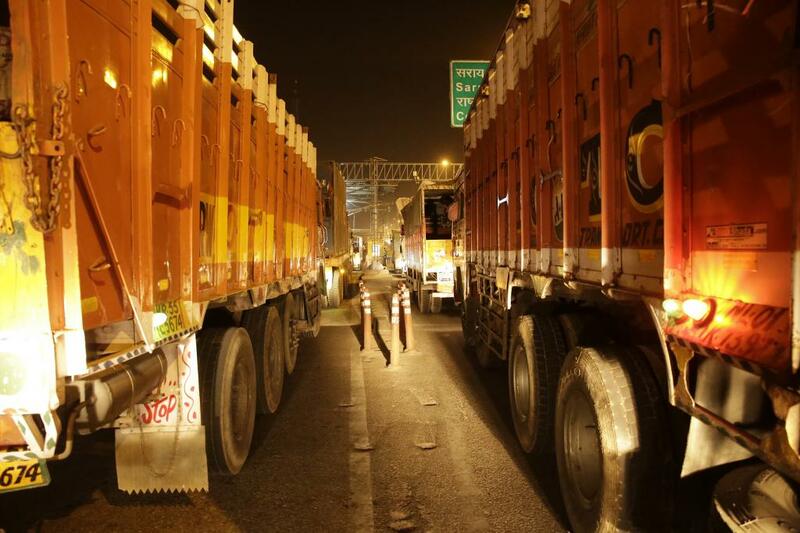 On September 16, 2016, India took a giant step forward towards tackling the pollution coming out from vehicles, when the Union Ministry of Road Transport and Highways notified the Bharat Stage 6 (BS VI) mass emission standards. The standards will apply to all vehicles manufactured on and after April 01, 2020. The draft BS VI standards were first notified in February this year. The original proposal planned to introduce the standards by the year 2023-24. However, the government’s decision to skip Euro V standards and directly move BS VI puts India in the lead among developing countries in the quest to curb vehicular pollution. There is a considerable reduction in the emissions of nitrogen oxides (NOx) and particulate matter (PM) from heavy duty vehicles as we move from BS I to BS VI. In terms of PM, there is a reduction of 50 per cent from BS IV to BS VI emission standards. Similarly for NOx, the reduction is as high as 89 per cent from BS IV to BS VI (see Graph: NOX and PM emissions from BS I to BS VI standards in India). According to the ICCT (International Council on Clean Transportation) 2015, Euro VI standards in India is a critical step in heavy duty vehicles emission standards which will result in significant reductions of both NOx and PM. BS VI is India’s equivalent of Euro VI. As per the report, Euro VI lowers both NOx and PM limits and introduces a limit on particulate number. This will lead to the use of diesel particulate filter in heavy duty diesel vehicles. The Euro VI standards will also revamp the testing procedure to better represent real world driving conditions, broadens the set of pollutants and strengthen durability and OBD (On Board Diagnostic) requirements. According to the ICCT paper “Comparison of real-world off-cycle NOX emissions control in Euro IV, V, and VI – 2015”, the Euro IV and Euro V emission standards compliant heavy duty vehicle do not achieve the real world NOX emission expected under those standards. The evidence indicates that a Euro VI emission standard compliant heavy duty vehicle meets expectations, even in the most difficult operating conditions. As a result, Euro VI standards may achieve a much greater reduction in NOX emissions from Euro IV/V levels than the emissions limits alone would indicate. The paper also suggested that countries considering to tighten their heavy duty vehicle emission standards from Euro IV equivalent to leapfrog Euro V and adopt Euro VI standards for maximum real-world benefit. The testing results strongly indicate that going directly from Euro-IV to Euro-VI will achieve a larger NOx reduction than the 88 per cent reduction in certification level would indicate. In practice, this number is likely closer to 98 per cent, and could be even higher due to the fact that real world Euro-IV/V emissions are much higher than the emissions limits would indicate. Euro VI standards not only ensure lower NOx emissions but can also give regulators confidence that off-cycle NOX emissions should no longer be an issue even for low-speed urban vehicles. In the European Union, Euro VI standards were implemented for all new vehicle registrations in the year 2014 with some provisions to be phased out by 2017. For the early introduction of lower-emitting vehicles, Euro-VI type approvals grants were started in 2009. To encourage the sale of Euro-VI heavy duty vehicle, the EU used tax incentives on the sale of Euro-VI certified vehicles before the full implementation of the standards. The two-fold benefits for the air quality by accelerating the adoption of Euro VI standards for heavy duty vehicles are the use of DPF’s to comply with new PM and PN leads to 90 per cent or greater reduction of PM2.5 emissions, and the new test cycles and in-service conformity requirements provide real world reduction in NOx emissions by 95 per cent or greater proving emission control even in urban driving conditions that remained a problem in Euro V.
The roadmap for emission standards in India is fundamentally flawed as it is not uniformly implemented across the country. The Bharat Stage IV (BS IV) emissions standards were introduced way back in 2010 in major cities. However, even in 2014, petrol and diesel fuels compliant to BS IV standards only constituted 24 per cent and 16 per cent of the supply respectively. The Auto Fuel Vision and Policy 2025 , explains this as unavailability of compatible fuel across the country. As BS IV standards have not been implemented in many states, vehicles following BS III standards—which are cheaper than BS IV vehicles—are registered in neighbouring regions. 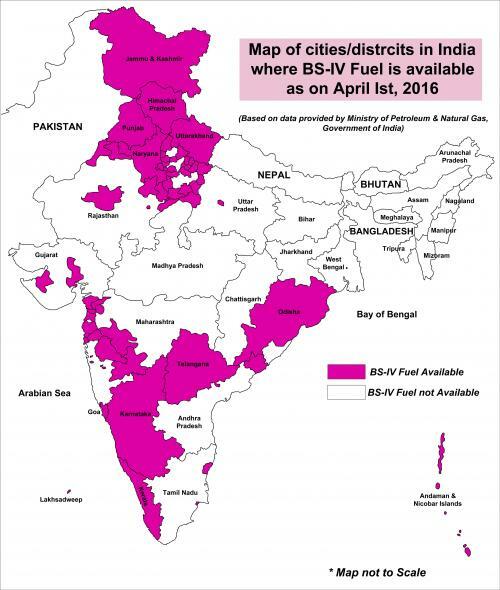 The coverage of BS IV remains limited (See map Status of BS IV fuel in India). The petroleum and natural gas ministry has recently committed to introduce BS IV fuel nationwide by April 2017. "BS VI standards will reduce heavy duty vehicular pollution". Really? India's problem is not standards. We have too many of them ... rules aimed at "fixing' earlier rules which were aimed at "fixing" even earlier rules ... ad nauseam. The need of the hour is enforcement. Pause on the side of any highway/street and note the trucks that pass by. The vast majority are decades old, don't meet current emission standards, are overladen and don't have working tail/brake/head lights. India is wasting time on theoretical "feel good" exercises when our focus should turn to "get your hands dirty" enforcement.